Typhoon VICENTE intensified rapidly since the last afternoon, and made landfall without losing intensity at about 50km west of Macau. A typhoon with such a strong intensity is relatively rare in this area, and there is concern about damage due to strong winds, heavy rains and storm tides in Pearl River Delta having large populations such as Macau and Hong Kong, because the delta is located in the right hand side of the moving direction, which is known to have stronger winds. Hong Kong once had "Signal 10" warning, which is the highest level of the warning. According to Hong Kong Observatory, this level of warning has been issued only 13 times since 1946, which means about once in five years. Typhoon VICENTE is almost stationary with a complex trajectory and is slowly intensifying in South China Sea. It is expected to intensify a little more, and will make landfall somewhere along the coast of Guangdong Province in the west. 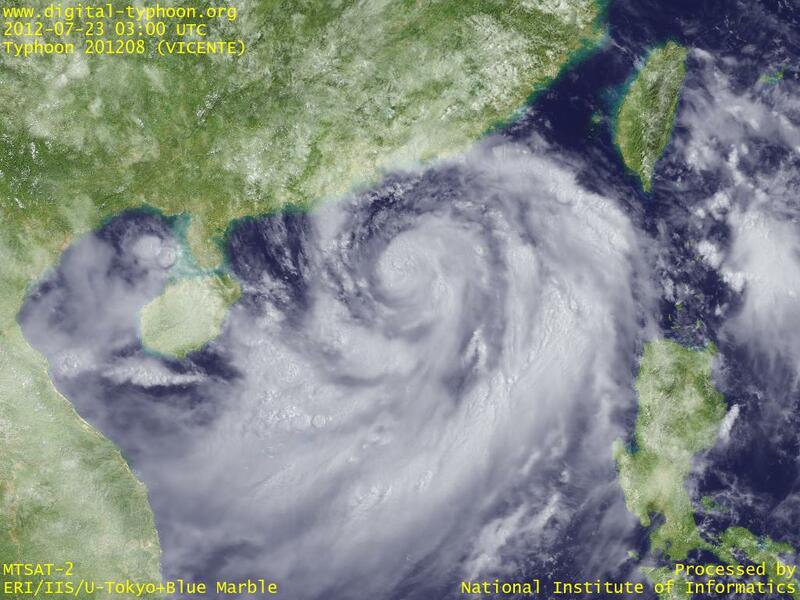 Typhoon VICENTE was formed in South China Sea. It is forecast to move toward Hainan Island in the south of China and Vietnam.